HARRISBURG (AP) — Fulfilling a campaign pledge, Gov. Tom Wolf today signed an order Thursday banning new drilling leases on public land, ending a short-lived effort by his Republican predecessor to expand the extraction of natural gas from rock buried deep beneath state parks and forests. The new Democratic governor signed the executive order before a small group of people who braved frigid temperatures to witness the event at Philadelphia’s Benjamin Rush State Park. He said the moratorium was rooted in a “deep-seated and profound respect” for state parks. “This is a beautiful state and this is one way we can promote that and protect it,” he said. 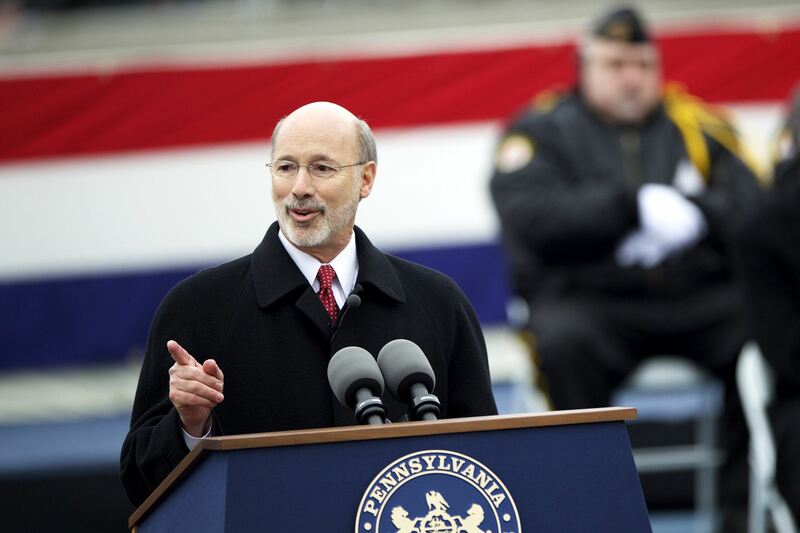 Wolf’s order supersedes an order that GOP Gov. Tom Corbett signed in May and reinstated the ban that Democratic Gov. Ed Rendell instituted in 2010. Environmentalists praised the action, saying it reflects Wolf’s support for strong environmental regulation. “The governor has wisely chosen to protect the people of Pennsylvania over the profits of drillers,” said John Norbeck, CEO of Harrisburg-based PennFuture. “This deeply misguided and purely political action to unnecessarily ban the safe and tightly-regulated development of natural gas from beneath taxpayer-owned lands flies in the face of common sense,” said the coalition’s president, Dave Spigelmyer. Corbett’s order authorized state officials to negotiate new leases for gas extraction through horizontal wells drilled from adjacent, privately owned land or areas previously leased for drilling in state forests. It also barred drilling-related construction that disturbs the surface of public lands, but that didn’t quell criticism from groups concerned about the impact. The new leases, which Corbett hoped would generate tens of millions of dollars to help balance the state budget, were ultimately put on hold in a deal with the Pennsylvania Environmental Defense Foundation pending the resolution of the foundation’s 2012 lawsuit seeking to block them. The state Commonwealth Court sided with the Corbett administration in a decision this month. It upheld the government’s right to lease more public lands for natural gas and oil drilling, and the diversion of rent and royalty payments from a land conservation fund to other programs. Since the first leases for drilling on the Marcellus Shale formation were sold in 2008, hundreds of millions of dollars of that revenue has been tapped to shore up the state’s operating budgets under Corbett and Rendell. John Childe Jr., the foundation’s lawyer, said the group is “very grateful” for Wolf’s expected action. The foundation will continue to press an appeal on its argument that the leasing violates a state constitutional provision that says public natural resources are “the common property of all the people including generations yet to come” and that the state’s role is to conserve and maintain them, Childe said. “We need to get some clarity on the meaning of the public trust,” he said.